Jerry Burrell (left) laughs as he and Terrence Banks repair shoes at Cliff's Shoe Shine on S. 40th Street in Philadelphia. It has been a family run business for three generations. Bishop Clarence Lewis III has his feet planted firmly and proudly in the past. "I came from the era when men got their shoes shined," he says. Lewis is 77, a retired truck driver who favors fashionable Paul Fredrick leather shoes and a pastor whose parishioners fawn over a fresh shine. He first came to Cliff's Shoe Shine at 40th and Chestnut Streets a half-century ago, back when the no-nonsense man who started the shop, and gave it his name, was still alive. "You ain't going to get a better shine nowhere," Lewis says as he waits from the short bench against the wall. Across from him, mere feet away on the shoeshine stand, is George Mitchell, sipping from a Dunkin' Donuts cup and looking sharp in a tailored blazer and pointy black boots from Boyd's. Mitchell, 53, a courier for DHL, found the shop when he was making a delivery 10 years ago. He's been coming back ever since. Why get a shine on the stand? "Well," he shrugs, "there's a conversation." This is the Wednesday afternoon scene at Cliff's, one of the longest-running businesses on West Philadelphia's eclectic 40th Street corridor, a few well-transited blocks bounded by an El stop and a trolley station, where shops sell everything from shoes to wigs to used books, where patrons can dine at the plant-based eatery HipCityVeg or the no-frills Indian buffet Ekta. There's even a street vendor who sells fresh fruits and vegetables. Over the last 25 years, the strip has been transformed from a dilapidated yet neighborhood-oriented corridor that University of Pennsylvania students were warned about to a vibrant destination. As the University City District completes its massive overhaul of the 40th Street trolley portal on Baltimore Avenue, newer, buzzier businesses are keeping company with shops that have endured for decades, like Cliff's, the Natural Shoe Store, and First Decisions barbershop. Those changes have largely been fueled by Penn. In a reversal of its previous philosophy, it began focusing its efforts on revitalizing the strip in the early 1990s — installing street lighting, planting trees, sprucing up storefronts. In 1992, Penn acquired and redeveloped property along 40th Street from Walnut to Locust Streets, retail that wasn't connected to any dorms. That marked a shift in the university's retail strategy that continues. Penn currently owns 340,000 square feet of retail, up from about 100,000 in the '90s, according to the university's top real estate official, Ed Datz. Penn also lured a grocery store and a movie theater to the area, in response to neighborhood feedback, which turned the strip into a nighttime destination. That Penn once had a tough time attracting a big box supermarket to the neighborhood is a sign of how much University City has changed. Last year, Penn announced plans by Acme Markets to take over the grocery store location from Fresh Grocer (though it's still unclear if that will happen). The school's mission to improve the 40th Street corridor was a "paradigm shift" in how the university connected to the West Philadelphia community, Datz says. Previously, Penn had taken a more us-vs.-them strategy, one that stemmed from the school's land-grab tactics in the '60s, turning the university into, as Inquirer architecture critic Inga Saffron put it, "an island of privilege in a sea of poverty." But 40th Street was different. Datz said the school's intention was to be "complementary and respectful" to the business district already in place. To retain the character of the strip, it did not demolish buildings. It didn't evict business owners who were already there, like the Natural Shoe Store. It worked with neighborhood leaders to see what the corridor needed. Paul Steinke, who ran the University City District during the 40th Street revitalization, said, "The ideal was that it would be a place for campus and community to come together, a meeting place instead of a barrier." That ideal feels realized at spots along 40th like the post office, Fresh Grocer, and Cliff's, where loyal customers like Lewis and Mitchell overlap with Penn undergrads dropping off their Uggs to be cleaned and Wharton M.B.A. candidates looking to get their shoes spiffed up before an interview. Two doors down from Cliff's is First Decisions, the black barbershop that Suran Casselle and Tyler Martin opened nearly 30 years ago, back when there weren't any businesses catering to the African American community at Penn, according to Martin. As it has evolved, the corridor has less of a neighborhood feel — "Everyone we cut is from out of town," Casselle said — and subsequently less customer loyalty, but business got better when the strip became safer. Students began to venture north of Penn's campus, ending up at First Decisions, Martin said. What's most important, though, is that the shop fills a need. "No matter how much gentrification, people always need services," Casselle said as he buzzed a client's head, bleached blond curls falling to the floor. Dilwar Hussain, or “Mr. Dell,” on one of the last days his body oil shop on 40th Street was open. It's been more difficult for some retailers to find their niche. Since he bought the property in 1986, Dilwar Hussain, who goes by "Mr. Dell," had tried selling everything from frozen fish to Muslim clothing to bottles of colorful, scented body oils from his storefront near the 40th Street El stop on Market Street, which explains why his store was a somewhat wacky hodgepodge of items marking all the years he'd been there. "Business is as slow as can be," he said. Hussain was 18 when he came to Philadelphia to escape war in his native Bangladesh. 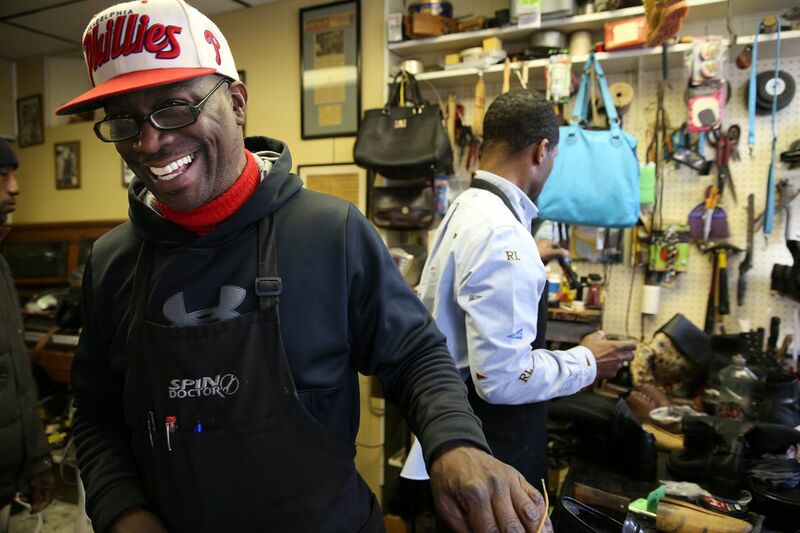 He talked his way into an apprenticeship with a watch repairman on South Broad Street and eventually opened his own shop. But as the other stores opened and the neighborhood's needs changed, he was forced to adapt. Now he's 65 and ready to retire. He shut down his store last week and plans to rent it out to a hair salon. "This is what life's all about," he said. "Nothing you can do. Old people die, new people take over." He described his shop as a home, much as do the cousins who run Cliff's Shoe Shine. "There was pride and happiness to be in here," says 58-year-old Jerry Burrell, who started working in the store under his grandfather's watch when he was 9. "It's like the living room back home." Terrence Banks repairs shoes at Cliff’s Shoe Shine on 40th Street. Though it's not the 40th Street their grandfather once worked on, where he knew everybody around, the gregarious Burrell and his quieter, more serious cousin, Terrence Banks, say business has gotten better as the strip has changed. Their clientele is more diverse. As Burrell puts it: "This business is always going to be busy, because people put their shoes on." Are rising rents an issue, as trendier enterprises catering to Penn students move in? "It's always going to be a factor," Banks says. "We deal with it." Burrell, who refers to his male customers as "doctor," says he envisions the shop lasting another generation in the family, though his grandsons are still a little too young to start at the shop — they're 5. Then he shakes Mitchell's hand and sends him out the door. "OK, doctor," he says. "OK, buddy."